In 2013, the Master Chorale of Saddleback Valley celebrated its 50th year. We are dedicated to providing a cultural service to Orange County in the presentation of choral masterworks, and to the encouragement of the musical performing arts in general. In addition, we strive to offer our performers, and members of the audience, the opportunity to participate in professional-level choral masterpieces. The group currently includes nearly 50 vocal musicians, and the Master Chorale of Saddleback Valley is the longest standing choral-performing group in Orange County. Please visit our History page to learn more about us. 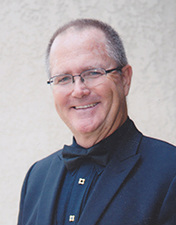 Singer, composer, conductor - Charles has been an active member of the Master Chorale of Saddleback Valley since 1971, serving on the Board of Directors for several years and as President for 3 years. He was appointed Artistic Director of the group in September 2006. Charles comes from a family with a long musical history. His grandparents Tom and Elsie Stephenson had one of the first ‘call in’ radio music shows in Chicago in the early 1900s. During his early years his family moved many times, living in numerous countries including Venezuela, Saudi Arabia, and Indonesia, giving him an interest and appreciation for many different styles of music. After returning to the United States, his family lived in Laguna Beach and San Juan Capistrano. While attending San Clemente High School his interest in music developed and he went on to major in music and vocal performance, attending Saddleback College and Chapman College, continuing with Liturgical Music and Liturgy at CDU. He studied voice with several teachers including Richard Dastrup, Jonathan Mack, Phillip McClendon and Nancy Bramledge Ewing. He has performed as tenor soloist at various synagogues and churches including Temple Judea, and Laguna Hills United Methodist Church. Charles has also performed with the Irvine Camerata, Glendale Symphony, William Hall Chorale, Long Beach Opera, Downey Civic Light Opera, Orange Master Chorale and numerous other choral organizations and opera companies. Throughout his career Charles has had the opportunity to work with many excellent conductors including Carmen Dragon, Roger Wagner, Dr. William Hall, Jester Hairston and Norman Dello Joio. In addition to performing and working with the Master Chorale of Saddleback Valley, Charles is Director of Music Ministries at St. Catherine of Siena Catholic Church in Laguna Beach. Charles, his wife Julie and their three daughters currently reside in Mission Viejo. Pianist, composer, and arranger Adam Bravo is an exciting presence on the Los Angeles music scene. He has served as pianist for Barbara Morrison, Sally Kellerman, the Coasters, Lara Johnston, and the Tim Gill All-Stars, and has appeared at venues from Disneyland to the Roxy to the Pasadena Playhouse to the Ryman Auditorium. He has also arranged for the Los Angeles County High School of the Arts (LACHSA), the Brad Steinwehe Jazz Orchestra, Eddie Wakes, The San Gabriel Seven (featuring Bill Watrous), Big Time Operator, and the USC Thornton Jazz Orchestra. While a student at USC, he won outstanding soloist awards at the Irvine, Fullerton, and Monterey Jazz Festivals as well as the big band composition competitions at USC (twice) and Monterey. Having recently received her M.F.A in collaborative piano from the University of California, Irvine, Adela Kwan Neth enjoys a career as an accompanist, pedagogue, and collaborative pianist. Neth has been a participant in master classes and residencies with notables such as Menahem Pressler, John Perry, and Morten Lauridsen and has participated in various music festivals and competitions. Principal teachers include Charlotte Zelka, Macy Zeng, and Dr. Lorna Griffith. Neth maintains a full studio in Los Angeles and Orange Counties and is a sought-after collaborative pianist and accompanist. Adela is relishing her residency as accompanist for the Master Chorale of Saddleback Valley.